Artificial Intelligence (AI) has regarded to be one of the most essential technologies to develop machine intelligence. The technology has advanced significantly over the ages to empower applications. Technology evolution in the AI sector is continuously driving the development of innovative applications across a wide range of industries. Innovations revolving around Deep Learning and Neural Networks have been on the rise in the recent years. Leveraging innovative convergence ideas with technologies such as virtual reality, cloud computing, Big Data, Natural Language Processing (NLP), robotics, blockhain and cyber security, groundbreaking applications are being developed. 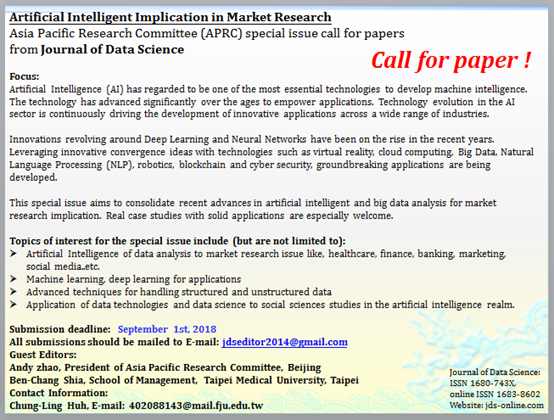 This special issue aims to consolidate recent advances in artificial intelligent and big data analysis for market research implication. Real case studies with solid applications are especially welcome. Application of data technologies and data science to social sciences studies in the artificial intelligence realm.